Today I’m on both audio and video, and I’m excited about talking to Dixie Decker. I met her recently at a national investor meeting. Go to my website for show notes, a transcript or simply to listen to a podcast again. You can search my podcasts by subject or by guest’s name. Dixie’s from Springfield, Missouri. She was invited to a real estate investing seminar in 2014 and started from there. She joined forces with an old friend who is now her fiancée. She is renting unfurnished houses to college students… the rent is calculated by the room with one kid per bedroom. The lease is for the entire rental amount. For example, a 3-bedroom house at $450 per bed would have a $1,350 per month lease with all 3 renters’ names on it. Dixie’s leases are all for 12 months. She gets the students’ parents to sign a lease guarantee; the student can sublet during the summer, if necessary. The same house would go on lease option for $850. Dixie is methodical with her houses. Tenants move only in the summer. Since parents are involved, the homes are generally left very clean. In fact, Dixie kept only 2 security deposits in 2018. Joe: Alright. Hey everybody welcome. This is The Real Estate Investing Mastery Podcast, I’m Joe McCall. We got a special little podcast here. Normally I just do audio but I met Dixie a few months ago in Ohio. She’s from the good old state of Missouri. You say Missoura? Joe: Okay. Only want to be nerds like me, Missoura. I’m from California and so it’s funny though you see some of the people down south deep South Missoura, will say wrastle, they like to go wrastling. Joe: Wrastling from Missoura, but anyway, so this is The Real Estate Investing Mastery Podcast and I wanted to get Dixie on the podcast with us and talk about her business. She is the nation’s leading expert on student housing, which I think is going to be really important for you guys because there’s a lot of students out there. There’s a lot of universities out there. And so this is a little niche that’s very, it’s a very profitable niche in the real estate investing space. I met Dixie in Ohio and we were both one of the, some of the speakers at a big national convention there, and I’m talking to a lot of my students that were there talking about how awesome Dixie was. And so I said, hey, can we get you on the podcast? And she said, yes, let’s do it. She’s from Springfield, Missouri. Joe: Okay, good, good. I’m having a hard time hearing you, Dixie. I don’t know if it’s me, but I’m just so if you could make sure you speak up, it’s probably my fault, but I apologize. Joe: So anyway, guys, if you want show notes, I’m starting to transcribe all of my podcasts now. So if you can, if you want the transcriptions of this podcast, if you want the show notes, go to RealEstateInvestingMastery.com. Just do a search for Dixie and you’ll see her show their RealEstateEnvestingMastery.com. Get the show notes, get the transcriptions a subscribe to the podcast, leave us a review on ITunes. We’d really appreciate it. So Dixie welcome to the show. Dixie: Hey, thanks for having me. Joe: Glad you’re here. Can you just tell us a little bit about you and how did you get started in real estate and when? Dixie: Okay. So I’m going to try to keep it really short as far as kind of my story and it’s not my part to tell I guess because it’s like the doom and gloom of it and it’s really that cliché story of broke to millionaire and it all started really in 2010. So I had been married for 10 years I have two kids and life was not going well. In my relationship there was emotional abuse, physical abuse. There was drugs and alcohol, there was other women that I didn’t know about and I said no more. So I really said no more because I, the last episode my daughter witnessed and she was almost five and I just said this isn’t the life that they deserve it’s not the life that I deserve and it’s time to be done with this. So at that time I was working a $30,000 a year job. He was so kind as to leave me with everything, meaning all the debt, the 3,500 square foot house on five acres, the vehicles and $150,000 in credit card debt with my beautiful score credit score that I thought I still had he had taken out a bunch of credit cards without me knowing. So that led into the bankruptcy. I survived that for three years and I finally went through that in 2013. So between 2010 and 2013, I spent a lot of time eating at my mom and dad’s house to feed the kids and sold the big house and started life over. So I ran into my seventh grade best friend and he said, you should go to this real estate thing with me on Saturday and I think it was Kansas City, and I was like, okay. He was this entrepreneur in real estate investor. Dixie: And I said, oh, okay. You know, I’d always loved real estate I had gotten my mortgage license and my real estate license during that ten year marriage because he was a builder. And so I thought, well, I can list houses and I knew traditional real estate, you know, you have good credit, you go to a bank, you get alone. I had bought my first house when I was 18 because I did take pride in my credit score and I had the job and so I knew how to do that. So I’m like, sure, I’ll go. So my mom says, yeah, I’ll watch the kids. So I go up on a Saturday and I met who is now my mentor that day and that’s when the world opened up to me. Meaning things like you teach your listeners all the time about lease options. I learned what that was. 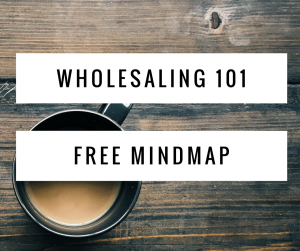 I had no idea that existed a wholesaling. I had no idea that existed before. Joe: Were you still in Springfield, Missouri at this time? Dixie: Yes, yes. So I had no idea this world even existed out here as silly as that sounds. And I was like, I can have a life again. I can do real estate again because I don’t have to have money or credit you can do it without those things. And I think that was the aha moment where I knew I could have more and I deserved to have more and I could start my life over. So I just went gangbusters that first year in 2014 I did 37 transactions and during that year, Brandon who’s now, I don’t know if I told you Joe, we got engaged and we’re getting married this year. Joe: Is this the friend from seventh grade? Joe: Was he at the Ohio even? Dixie: He didn’t come to Ohio he got to stay home and take care of the kids. Dixie: Hey thanks. So yeah, we joined forces to run the business together. We started dating and we, he, when he had gotten out of the military, he had that like GI money from going to war and he’d come back and go to college. So when he did that, before we had met him and his buddy battle buddy fixed up this little house around campus and rented it out to some college kids. Joe: And this was what year? Dixie: I bet that was 2010 for him, 2010 for him. So he had once told me about this. And then when we got into that new real estate world with creative financing, subject twos, lease option, owner financing, the goal was to find a tenant buyer to put in these houses we acquired and we couldn’t get rid of one of them because it was by campus. So I said, why don’t we try that thing that you did with that one house and you rent it as college students. And so we did and it worked. So then we just did it some more and some more because the cash flow was two to three times more than what any single family rental was bringing in even on a lease option. Joe: That’s really important, I don’t know if everybody’s listening. Dixie: That’s the secret. So we priced the, the bed to the student, but they all get together, they know each other, they come to us as a group and we have them sign one lease with everybody on it and parents co-sign it. Joe: So like if there’s four kids, all four parents have to sign it? Dixie: If I can get all four. So quite frankly, if I can get to two of the four, I’m happy with it. Joe: Yeah get the richest ones. Okay. Wow. Did I lose you? Dixie: Nope, I’m still here. Joe: Oh, okay. Okay. My screen disappeared, sorry. So give us an example. Like, well in this example, the, how many bedrooms was the house? Dixie: That house was a three bedroom house. Joe: Three bedrooms. And how many beds did you have in there that you were renting out? Dixie: I just, I just market it as a three bedroom house and I put one kid per bed per bedroom in there. I don’t furnish it and we were marketing it as a tenant buyer house for about $850 a month and then I market it to students for 4$50 per room. Joe: Wow. Okay. So then but do they have to be friends or are. So do they have to know each other already? Dixie: Yes. Yeah. So I won’t match make them. I did that one time and it was, it was a really miserable 12 month period. So I don’t match make anymore. Joe: So it’s got to be, they kind of find themselves, they get together and say let’s do this. Okay, nice. How do you advertise that thing, how do you advertise that in your ads? Dixie: So I advertise just like your market any house with the exception of in say our Zillow ad, it shows for $450 for the house. Well, in the ad we just add in there, you must build a whole unit and it’s priced per bedroom. So then they bring us their friends and they made friends that freshman year of college or a sorority or fraternity house or something like that. So they already know how many friends they want to live with. Two, three, four, five or whatever the case is. Joe: Nice. And then, so when you advertise a three bedroom house on Zillow, you’re advertising it how, as a one bedroom for $450? Dixie: No, at three bedroom house for $450. Joe: I have lot of interest in it. Dixie: That’s the risk you gamble with a little bit is you do get junk calls and of course I have a virtual assistant that sifts through all that junk for me for super cheap, but that’s the risk you run and then sometimes I play with it and I’ll market it for the full rate because college kids are looking in a certain radius of the university, but we get more calls off of the price per bed. Joe: And this is a 12 month lease? Joe: You don’t, you don’t let them do month to month or just nine months? Dixie: No, because I don’t have any vacancies and I don’t have any evictions for college students and so we tell them upfront, this is a 12 month lease. We understand you may go home during the summer, some of you won’t. You’ll have jobs during the summer. So what we advise you do is if you’re not going, if you go home for the summer, find somebody who needs to sub-lease during the summer from you and just bring that, bring us their application and we’ll sub-lease it to them for you. But they don’t have to maintain it. Joe: But your still collecting for $450 per room? Dixie: Yes. Yes. So essentially they know they’re responsible for it if they don’t find a friend to bring in, if they go home they still have to pay it. And the way I kind of do my math is whatever they pay at the dorms for the nine months, right? Because they go home during the summer from the dorms, whatever they pay in those nine months, that’s what I set my rate for except for 12 months. So they get my place for 12 months or they get the dorm for nine months and they’re paying the same money, same cost, right. And then I tell the parents, because everyone goes, why would anyone sign a 12 month lease? I said, well, I just ask the parents are pretty simple question, would you like to spend your vacation days taking a vacation instead of coming down to Springfield, Missouri and moving your kids out of their dorm in the middle of May and then you got to bring them back in The middle of August and moved them back in when it be much better just to leave them put and they’re like, Oh yes. And if you meet anybody that has a college kid, they know they have to go move their kid out of the dorm and then they got to go move them back in every year. Joe: What about utilities? How do you do utilities? Joe: Would it, okay. So when, when you’re withdrawing the rents, who, it’s just one payment that you’re taking. Like is it, do you do, do you require like a bank account and you withdraw the money or do you, do you wait for them to send you a check? Dixie: So when I first started out I was the like Microsoft spreadsheet girl just getting checks delivered by mail or they would walk them into the little one bedroom, one bedroom office we had. So we did that for awhile. Now we have switched over to AppFolio, a property management system and they have their online portal they pay right through there. And the two things that I did was we do tell them we want one lump, so usually one kid’s in charge and everybody pays that kid and then he pays the bill. We tell them if they want to pay separately, that’s fine with us, but rents an extra $50 a month if they pay separately because we got to process more money and all that stuff and they go, okay. Joe: What do they normally do? Dixie: They usually just log on and somebody pays it through that portal all as one check. Joe: One of the things I’d like to do with my rentals is require that I get their checking account number and do an ACH withdrawal on days they get paid because then they don’t have to worry about it. It could be every two weeks. It could be the first and the 15th, but then it just gets like the taxes just gets withdrawn. Are friendly federal government likes to do that to us. Why can’t I do that as a landlord, right? Is there Anyway you could do that as well? Dixie: I think AppFolio will let the parents set that up so a lot of times the parents will even log on and set it up to go autodraft ach right out of their bank accounts. I haven’t played with that yet and really in this niche, I never really worry about getting paid because the parents are paying the rent. Joe: This is stressing me out. Dixie. Dixie: I don’t stress about it. Joe: No, but my kids. I have a 15 year old and a 13 year old boys and they’re getting ready to go to college soon. I’m going to have that landlord like you that’s going to make me responsible for their rent. Dixie: Yes. Yes. It will happen. It’s not going happen, Joe. You’re going to go buy one with your lease option and you’re going to put your kid in it and then you’re going to get the rent from your kids’ friends. Joe: That’s exactly right. Exactly right. I’m just writing down these questions. So you could actually, you could go buy these properties creatively as well, so you’re not, you’re not going out and we’ll talk about that in a minute. I want to find out how do you find these properties? I want to know if you do this, can you do this out of state because you’re in Springfield there’s a couple of universities there, right? Do you do this in other markets? Dixie: I have not lived markets. The reason is because our university, the one that I get fed off of, let’s say it is Missouri State University and it has a little over 24,000 students enrolled, but on campus they can only house a little over 4,000 of them. So 20,000 students need a place live. I don’t need to go anywhere else yet. Joe: That’s a good point. Now you have some big Christian colleges there in Springfield too. Does it matter, do you prefer one or the other? Dixie: I have a theory or a formula and it’s what I just gave you. It’s really what is your enrollment versus what can live on campus? And if they have no dorms at all, that one’s probably out because there are definitely commuters still living with mom and dad or they’re on a super tight budget and mom and dad probably aren’t going to be involved. So when you’re looking at something, I say let’s, let’s do the numbers on it like that to make sure we have a demand and then it can work for any college as long as they have the ability to put some people in on campus housing, but not enough for everybody. Joe: Okay. So you don’t do any, you don’t do any a furnishing of the apartment? Dixie: I don’t do any furniture. Joe: Landscaping you do you take care of that? Joe: Yeah, it’s not that expensive. And you can still, you can add it to their rent, make them pay for it. And you still find it’s easier to make them pay utilities than it is to just tack it onto the rent and you pay it yourself? Dixie: Yeah, because mom and dad give them like a budget of so many dollars per month. When your kid goes off to college, you say you got $600 a month and that’s your food and rent. Joe: I’m not giving my kids any money. I had to work so hard when I went to college. Like I had, I went to college full time and I worked 20 to 30 hours a week, sometimes more and I was on my own. Dixie: Yep. Well there’s a lot that aren’t like that. Then they spend that money for beer or food and then you don’t get it, you don’t get to charge them for it in utilities and the parents will pay it eventually the over overages and utilities they will or you’ll get it out of the security deposit down the road, but it’s just not worth it. It’s easier for them to take care of it. Joe: Okay. Let’s talk about guys versus girls. What do you prefer it. Dixie: What do I prefer? So I think it can go both ways, but I probably like the boys better. Joe: I’m surprised, I thought you were going to say the opposite. Dixie: Well, here’s the deal. I have, I have two daughters, so I love girls. I know how they behave and act and they seem much cleaner and calmer than boys for sure. But what happens is the girls have all this makeup and hair spray and they self tan and all this stuff and then their still lazy and they don’t like to clean in college. And girl’s parents don’t quite baby the girls so much and they say go clean up your own mess. The boys’ mamas will come down and clean the house for them. I kind of, I kind of, you know, I’m like the mama’s, the boys’ mama’s kind of of spoil them. So I always know it’s a cleaner house in the end when the boys live there because mama’s come down and clean it because they want their security deposit back. Joe: Okay. Talk about maintenance and repairs. Is it more challenging with student housing for maintenance and repairs? Because a lot of times these are older houses too, right? Dixie: Well they are, but a lot of the stuff I buy, I either buy it already fixed up from a parent who bought it for their kid and now their kids graduated or I do buy it with private money and then I rehab it myself so I don’t have any maintenance like regular type maintenance stuff. So I do this I think it’s a 16 minute video on YouTube and it gets sent to every single tenant before they’re allowed to sign their lease and move in with us. And it basically says we’re not your mama’s and toilet handles don’t break themselves. Holes don’t punch themselves in the walls. So if you do any of these things you need to call and get it fixed yourself. And if you don’t, your mom and dad are going to find out about it and they’re going to have to pay the bill. Dixie: And the parents get the video too because they’re co-signing. So I mean, aside from like your major mechanical things, heating and air, plumbing and a roof I don’t have a lot of maintenance because this stuff doesn’t break itself it just doesn’t. The most common thing is a garbage disposal and typically they have to pay for that as well because it’s a beer bottle cap down in there, it’s a lime rind, it’s an orange rind from their Blue Moon beer or whatever. So we tell them up front, if you call us about your garbage disposal will get a plumber out there, but when he takes a picture of whatever stuck down there, you’re going to pay his bill. They’re like, okay. So I don’t have a lot of issues with it. And the cool part is when I do have my live trainings here in Springfield, I take a bus of people around to my properties so they can actually see that the walls look as clean as your walls behind you and they cannot ever believe it. But what happens is I only move students in and out of houses in the summer. So at the very end of May, in 2018 we moved out 24 houses and we moved in 24 houses the following day. That’s how clean they leave them. Joe: So you have about 24 properties right now in Springfield? Dixie: No, I probably have a little over 60. So I did 24 at the end of, I think I did four at the end of June and then we did another 10 at the end of July and everybody else rented for another year. So they didn’t do any moving in or moving out, they didn’t graduate, they didn’t do any of that stuff. And of course I don’t turn them over anymore, my assistant does all of that and really all she has to do is the paperwork to check them in and out because they leave them all really in great condition because mom and dad came down and made sure of it because they want their $2,000 security deposit back. Joe: You’d take that security deposit really seriously? Joe: And you let the parents know, hey, we’re taking this very seriously. Dixie: Yes. And the way we phrase that I think is very important is we tell them, hey, we want you to be successful living here and we want to give you back every dollar of that security deposit because if we get to give it back to you, that means you left us a clean, gorgeous house and no harm, no foul. Other landlords who only get $800 in a security deposit for a single family rental around here in Springfield, Missouri almost every landlord has to steal that deposit so they can cash flow that property for the year. I don’t need to, so I use it as a reward token to say, hey, we want you to be successful and get this back. I only kept two security deposits last year for dirty carpets and I have 276 students living with us right now. Joe: That’s amazing. Okay. I want to talk about parties. What do you do and how do you preach? Well, first it’s about prescreening. What do you do for prescreening and what do you do about parties? Do you have rules about that? Dixie: You’re going to really cringe at this probably, or every landlord listening is, I’ve never ran a single background check on any college student or their parents living in any of my houses because I don’t need to. Dixie: I don’t need to. Joe: So if they’re accepted into that college and they’re probably already in pretty good standing and they’ve got their parents who are co-signing everything. Dixie: Right. So I don’t even, I wouldn’t even tell you tell you what company to go do that with because I just don’t do it. And it’s a waste of money to do it on the college kids because most of the time they don’t have any credit. They’ve probably never had a job. Mom and dad are still taking care of them. So it’s really not a big deal. The second question you asked me about the parties. There going to happen. Get over it. Their moms are going to come clean it up so don’t worry about it. We just have the city note a noise ordinance in the lease and that’s it. So if they do, we just tell them, hey, if the police come, that’s your problem, it’s not our problem, you know. And so I think, let’s see, we started this in 2014, so four almost five years I’ve had two neighbors call about parties and I just have to say I, you know, I advise you, call the police, that’s what I would do because it’s a people problem, not a property problem and, and so it’s self managed and I tell people if you want to control them having parties, this is the wrong business for that. All you need to do is care about how they treat the property and how they leave the property. Joe: Do you ever get invited to the parties? Do you ever go? Dixie: So we occasionally have those college kids that say, hey, we’re cooking, we’re cooking this, you guys could come on over, you know. But in September I ran my life training here in Springfield and we go to my students, my college students houses. So I had a bus of 50 investors loaded up that week before they came, my assistant called the houses and said, hey, we wanted to let you know we’re going to be by on Saturday we’ve got a few investors we want to show them how the house looks because they’re interested in doing this in another state. And they were like, we’re kind of having a party on Saturday. It’s a home football game and it’s parents weekend. And we’re like, it’s fine. You know, if you guys can just be respectful when everyone’s there, we don’t mind it’s no problem. They come through the office door about an hour later and they’re hanging their head down low and they said, Ms. Jessica when we told you we were having a small party, we really meant 150 people in the backyard. Joe: But how cool that the parents were there. Dixie: There was at least we saw at least four sets of parents in, it was two houses that I had that sit next door to each other, so between them is six students and there is at least four sets of parents we identified in the yards as we came up on the bus and after we left we had an email from one of the students that said, Hey, my dad is really interested in doing what you guys do or if you’re interested in having some kind of partner or funding, he’d be interested in it. So who knew private investors. Yeah, so crazy. But yeah. So they definitely have tailgate parties at 9:00 in the morning. Joe: Do you, do you manage your own properties or do you have a property management company? Dixie: I do self manage and by saying that my assistant really does everything for me now. She does all the showings, she does the marketing, she gets all the leases signed, she checks them in and out. And I do very, very little except when I want to make sure things are going right, I’ll make sure I show up on turnover day to make sure everything is still being implemented and they do a really great job. Joe: And so one assistant can manage all of that for you? Dixie: So far. We are in need of another one right now. I have a four story apartment building going in this winter right now that we’re actually building and another handful of properties that we’ve picked up in and are renting out. So it is time for another person to help her out. Speaker 1: But what’s crazy? I like that though because a lot of people think you’ve got to get a property management company to manage your property when sometimes the best thing to do would just be to hire an assistant. Depending on how many doors you have you might even save money, but that one assistant now is just managing your properties, not five, you know, 20 other investors. Okay, cool. Another question I had is inspections. Do you do regular inspections on these properties? Dixie: We don’t. The only thing I do, I guess you could call it an inspection, is I do have a handyman go around for one day and it changes all the filters on my properties every quarter. And so if there were to be something catastrophic, I guess he would let us know, but there hasn’t been, so we do that. Otherwise we don’t really show up unless we’re showing the property and usually I only have to show a house one time and it’s rented. Joe: Yeah. Okay. Nice. Another question I had is, will you talk a little bit about how you find these deals? Do you, what kind of marketing do you do and what percentage of them are you buying with cash or creatively with some owner financing or lease options? Dixie: Okay. So that, those numbers kind of change as the market changes I’ve noticed when I first started, everything I did was creative financing and a little bit of private lending because I wasn’t bankable, I couldn’t do anything traditional as we’ve grown in the markets and you know, kind of going up, I am probably into, I’d say I’m 40 percent creative financing this year and I’m up to about 60 percent private funding, but I’ve been doing, I have nine rehabs going on right now. So that’s usually when I do a lot of private lending is when I’m rehabbing them. So that changed this year and I rehab them really nice because now I’m a hold, I’m holding, I’m a long-term strategy. So that was the two I’d say. That’s my percentages. When I started off it was all creative and I only had one little lender I found. But then that’s kind of grown over the years. Joe: So very little bank financing. Dixie: Right now sometimes I’ll do bank financing with a credit partner because it’s my, it’s my little form of private lending I guess you could say because they don’t have liquid cash, but they have really good credit scores and they have a day job and they don’t want to be involved in real estate. So I’ll partner up with someone like that and they can go get the bank loan and then I just put the whole deal together, I don’t sign on anything. And typically when I do that I get 70 percent of the deal and they get 30 percent of the deal. Joe: Yeah. I was going to ask how to do you split when you have a private investor lending you money, do you pay them a percentage or like an interest rate or do you pay them a percentage of the deal? Dixie: So a credit partner, I do the percentage of deal. If they are liquid, meaning they’re basically the bank, then I just do an interest rate anywhere from six percent to 10 percent depending on how long I want to hold it and what they want and what the deal will allow all of those things. Joe: Is it, how is it challenging to get bank financing on student housing like this? Dixie: So I have a lot of investors that I’ve learned student housing and they’d have no desire to learn how to do creative buying, so they go get bank loans. They’re just getting a bank loan on a single family house. So this term you and I are talking about today, student housing is only what we use in any other facet, it’s just a single family house being rented with one lease in place as a single family rental. So for insurance purposes and everything else, it’s just a single family house rental. Joe: This is so cool. I mean, you’re getting on average on a normal three bedroom house, you’re getting an extra $500 a month in rent on top of what you normally would. And your vacancies are practically zero, that’s amazing. Dixie: They’re only vacant if I buy them in the middle of something and I just don’t have it rented yet otherwise, so it’s, we’re just the beginning of January. The kids in college are just coming back from their Christmas break before they left for Christmas break, our goal is to have 75 percent of our properties pre-leased for the next whole year, meaning they all signed leases before Christmas to move in this summer, the next summer. So I sleep really good at night because I know I am 100 percent occupied until 2020. Joe: That’s really cool. Very cool. How do you find your deals? What kind of marketing do you do? Dixie: Oh, so you’re, you’re going to slap me for this and your listeners are going to cringe for this, but right now I’m doing no marketing at all. I when I first started, I was the yellow letter girl, the postcard girl. I put bandit signs out everything now because I guess there’s so many of these gurus coming to town, there’s so many green investors out there spending all their dollars doing all that marketing and then they don’t know what to do with the deal. So I have networked, I guess with enough people at our local REIA meetings and things like that to say, Hey, when you get a deal you don’t know what to do with it, bring it to me and I’ll either buy it as a wholesale or we’ll structure it as creative financing and I’ll pay you something to just get out of the way. And so people just bring us deals all the time because they don’t know what to do with them. Joe: So even in a smaller market like Springfield, Missouri, you have a lot of competition there for deals? Dixie: Oh my gosh. We actually really do there is two or three of us that actually travel and teach real estate in some facet and we live here in Springfield, we run our businesses here in Springfield and so were competitors for sure, but we’re not because we all really work well together, but there’s a slew of other new investors all the time. I mean there’s two or three bandit signs on every corner and none of them are mine. Joe: How competitive is it for the landlords, like you looking for these kinds of houses? Dixie: Well, most landlords cringe at the thought of college kids because they don’t understand it or they don’t run it properly or they just hand over keys and saying, good luck. And as we talked earlier, I really dangle that carrot about their success staying in our properties from the very beginning. And we don’t sugar coat anything we tell them right up front, if you do this, this is what happens. So there’s a little bit of competition for those very old landlords that have been around for years and they still have the slummy houses. The college kids are partying in and their floors are crooked and the beer pong tables and your shoe stick to the floors. Those are still out there, they’re just not my properties because mine are granite tile hardwood, they’re gorgeous. I get, I get a gorgeous amount of rent per room as well because they’re gorgeous. Joe: Yeah. Yeah. I’m getting some questions here and we got to wrap it up any way. We’re right at the top of the hour. So guys, if you’re watching us right now on Facebook, go ahead and type your questions in because we only got a couple more minutes with Dixie. How can people get ahold of you and what’s a good website to go to? Joe: DixieDecker.com. D I X I E Decker, D E C K E R. Cool. And you’ve got a free report right there that people get. What does that report d? Dixie: It just kind of tells them why student housing. So it’s a little bit about what we talked about today. It’ll get them in, so they’ll get the next free training that comes out and they can learn more, so more than what you and I can even chat about here today. And then they can decide if that’s something that interests them. I have a lot of fun with it though and I think no matter what niche you’re in, you should have a lot of fun with it. So even when I did it all myself, I just had fun doing it and I think you should love whichever niche you pick or maybe you only need one or two of these things to start replacing some of that day job income. And I like it because I don’t have to scale this business. Every investor I run into these days is just chomping at the bits to scale bigger and better and faster and I don’t really have to because they spit off so much income I don’t need 500 houses. Joe: Well this is amazing. You’ve got it. You’ve built your net worth up to over $5,000,000 and you’re getting over $100,000 a month in positive cash flow from these student housing, right? Going from devastating divorce and bankruptcy, a mother to rebuilding your life. That’s amazing, Dixie. Good for you. Dixie: Thank you. Thank you. Joe: Congratulations. So again guys, if you want more information about Dixie and we just scratched the surface, but I wanted to open your eyes to the possibility of student housing and we’re not talking about buying huge apartment complexes and renting them out to students were talking about bread and butter, single family homes, renting them out by the room, getting mom and dad to co-sign the lease, making $500 more dollars a month in cash flow than what you would normally get. And these students are taking actually real good care of the homes. So you got to manage them right. If you want more information about how Dixie does this go to DixieDecker.com. I’ll put the show notes. That link will be in the show notes. 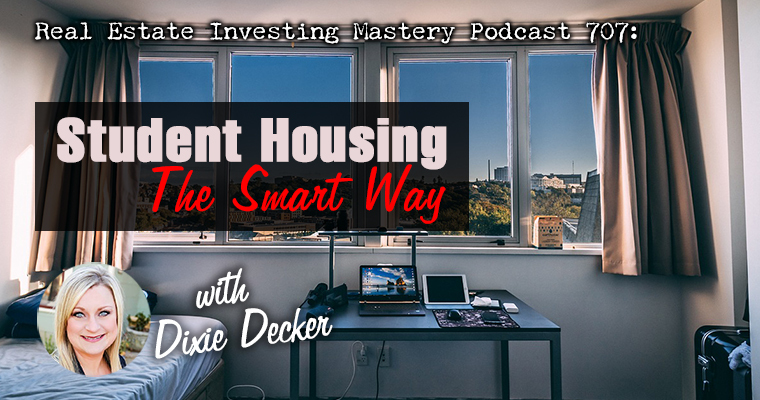 You can go to RealEstateInvestingMastery.com, look up Dixie in the search bar you’ll find the podcast also there will be a transcription of this podcast there as well. Anything else you want to say Dixie before we wrap it up? Dixie: Not really. Just whatever you pick, just go for it. Take some action, don’t reinvent the wheel. Do what someone else has already done and most of the people that are successful do that. They don’t go create some new system. Although student housing sounds like a new system, I bought them the same way you teach. I bought them the same way my mentor taught me to and I just dialed in my systems to be a better landlord than anybody else and monopolized on the success points with the parents being involved. So if you don’t do those things, you won’t have the same success. So you’ll come back to me and say, well they left the house just a mess. Well, did you get the parents to co-sign? No. Okay well parents weren’t involved. You did it to then and we’ve all partied in those houses. If you went to college for even one semester, you know what that looks like. Joe: I didn’t I was too busy working, which is what my kids are going to do when they’re going to college. I’m not going to be that parent. Dixie: My daughter. I’ll make this really quick. My daughter’s 15, she’s searching for her first real job because she wants a car and I’m kind of the same way as you. I’m not paying your way for stuff you know. She did the math and she says, oh my gosh, mom, I have to work 25 hours a week at this teenage job to make the same amount of money you’re making off one house in one month with college kids in it, but she has to work 25 hours per week every single week to have that same income. Joe: Are you teaching her the business? Joe: I’m actually taken my two boys next week to a bootcamp in Tampa, Florida. Dixie: She signed up to go to one in Jacksonville in May when she’s out of school, so she’s excited. Joe: I could teach them myself. I want them to hear it from somebody else as well and so cool. Thanks for being on the show, Dixie. Joe: Appreciate it. Guy’s checkout Dixie’s page, DixieDecker.com. You could probably are you on Facebook and all that too. Alright, good. Just look her up and go to the RealEstateInvestingMastery.com to get the show notes and the transcription now and all the links for this. We appreciate you Dixie. Congratulations on your engagement and we’ll see you later. Thanks again guys.